“As part 2 of this article series, we will be addressing certain engineering factors that are extremely critical in the manufacturing process of these larger “super-center-console” boats, and why? One of the first and foremost considerations is the structural integrity of the hull design itself. There are many methods used in the marine industry, but not all of these produce a well-designed hull that will not only ride smooth and dry, but support these increased LOA boats upwards of 40 feet in length, yet maintaining a reasonable weight to size ratio that does not require additional expense in powering a boat that is too heavy, or so light that it reduces the overall ride and comfort and still maximizes deck space. The strength and structural integrity of stringers, bulk heads and the integration of the liner and cap can also mean the difference between unnecessary vibrations and stress cracking in critical locations over time that can be costly to repair and reduce the value of the boat in a short period of time. Then you have the balance concerns, especially when it comes to console, power generation and gas tank placement and installation methods. Let’s address these engineering factors so you as the customer are educated as to what questions to ask and what to look for in your next super center console boat. Fiber Reinforced Polymer (FRP) composite boats have been in production for over 70 years. During that time period, much information has been collected on the best engineering and fabrication practices to follow. As the hull sizes for center console boats have increased in recent years, proper engineering has become ever more important. Bahama Boat Works has employed the lessons learned by the industry to manufacture the most structurally sound and durable center console vessels possible with current technology. FRP Characteristics: It is extremely important to acknowledge that fiber reinforced polymer composites are non-isotropic in nature. That is to say that they do not display the same physical characteristics in all directions like metals do. Instead, they are inherently highly directional. While the resin matrix used will behave in an isotropic manner, the fiber reinforcements that are held in column by the cured resin will distribute stress in a linear fashion – kind of like how spokes on a bicycle wheel work. “Load paths” can be accurately defined and positioned. When FRP composites are simply considered to be isotropic, the considerable potential benefits provided by the reinforcing fibers will most likely not be enjoyed. Integrated Structure: The advent of monocoque construction techniques revolutionized both the aircraft and automobile industries. The term monocoque means that the skins of a structure assume all or most of the loads that might be applied. For example, in the automobile industry, “unibody construction” yielded stiffer, lighter, more durable and safer structures than the older “body on frame” techniques. Load energies could be more widely distributed. Structural strength is defined by the amount of applied energy that can be distributed over the largest area possible. When a structure is “integrated”, the increase in area produces a great benefit in strength, if for no other reason than the increased surface area. When equal consideration is given to both the shapes of a structure and the load paths provided by the materials used to fabricate it, a synergy is produced that can yield a highly durable result. 1. Using Bahama Boat Works’ True Molded technique, after being gel-coated and skinned with vinylester resin and all hand laid chopped strand mat applied, all hulls are vacuumed to their mold for the entire three week, 24 hour per day period of their construction. 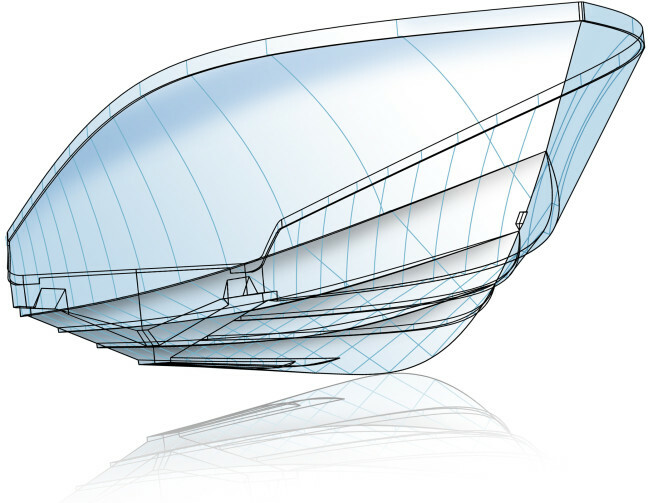 While other boat companies will remove a partially finished hull from its mold in order to make room for the next order in their production cycle, Bahama Boat Works resists this temptation in order to produce a hull with the highest fidelity to its original CAD/CAM model. All internal structure has been completed and cured before the interior liner is applied; then the liner is ALSO vacuumed into place. Only after both hull and liner are fully cured is the hull vacuum on the hull mold released and the completely integrated structure removed from its mold. It’s not the fastest process, but it is absolutely the BEST process! 2. After initial skinning with hand laid chopped strand mat, hull bottoms receive two layers of biaxial fiberglass in their spray strakes before special purpose-engineered elastomeric putty is used to fill them. This allows the following bottom laminations – six alternating layers of 0-90 & 45-0-45 biax on the sides and nine alternating layers in the center – to provide straight load paths across the bottom. From the chines upward, the topsides feature three layers of 1 ½ oz. hand laid chopped strand mat, 1708 biax, 1” Corecell foam vacuumed in place and 3610 quadrax fiberglass fabric. 3. All five stringers employed in the hull are solid fiberglass laminates, produced by four layers of 3610 quadrax in a vinylester resin matrix. This fabrication technique produces stringer reinforcement that does not produce hard points in the bottom when they are applied, thus eliminating the “hinge effect” of glassing non-flexible frames to the craft’s bottom. 4. Next, all structurally built interior wells are bonded in place to the bottom of the hull with a special flexibilized vinylester putty, and then fiberglass taped in place. This integration process not only assists the stringer system in linear strength, but also provides no less than nine bulkheads to resist hull twisting. 5. The transom structure features six alternating 0-90 & 45-0-45 biax laminates, 1 ½” 30 pound Coosa and six more alternating biax laminates – with two additional “knees” outboard of the full-length stringers. 6. Heavy duty 1/4” aluminum fuel tanks, zinc chromate treated for maximum anti-corrosion protection, contoured fabrication designed to maximize fuel capacity and utilization of below deck compartments, and then are thru-bolted, foamed in and fiberglassed in place, then both tank compartments are sealed with fiberglass laminate. 7. When all internal structure is applied and cured, the prefabricated interior liner is vacuum bonded in place to the stringers and wells using specialized adhesive putties, integrating the finished deck and topsides with the rest of the hull structure. 8. The hull is finally removed from its mold when all curing processes have finished, and is now moved into the rigging phase. Center Console Bahama 41 hull removal from mould. The 65 plus years of combined marine and boat building experience of owners; Bob Sparks, Scott Henley and Rob Thomson of Bahama Boat Works, share the same passion and commitment of one paramount goal that is never overlooked and kept front and center throughout the entire engineering and manufacturing process. “To make the absolute finest center console boat by setting a standard unequalled in the marine industry.” The result is a reputation that precedes itself and continues to satisfy every owner with many, many years of sustained value and performance. See what they have to say (click here).